Oceanic waves of sea green, teal and marine ripple across Caspian? the newest addition to the Knit Picks Options family! Adorned with a sea-inspired colors, Caspian boasts the same strong and smooth layers of laminated birch that you know and love. The 5" Caspian wood double pointed needle set makes the perfect gift for the sock and mitten knitter who favors wood needles. We have assembled the six most common knitting sizes and packaged them in this portable, flexible, 5.875" by 6.375" vinyl case with snap shut closure. Each size is neatly labeled on the enclosed packaging so you can see the sizes at a quick glance. Watch the metric sizes - they are more finely tuned than the US sizes. 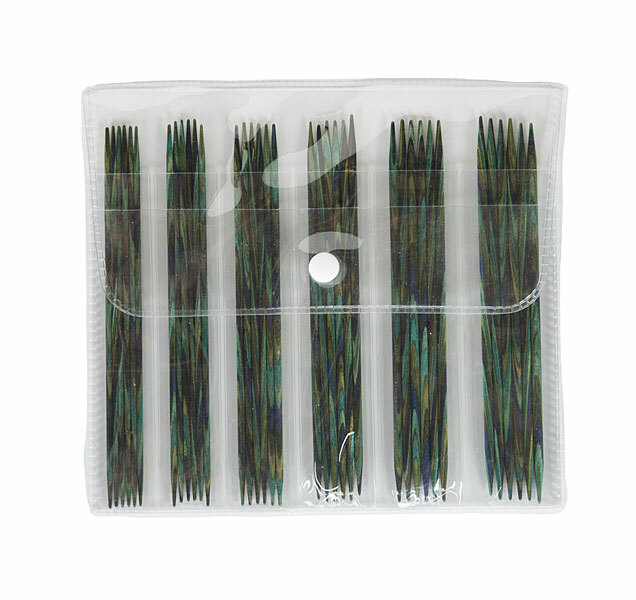 Set of 6 needles per size. 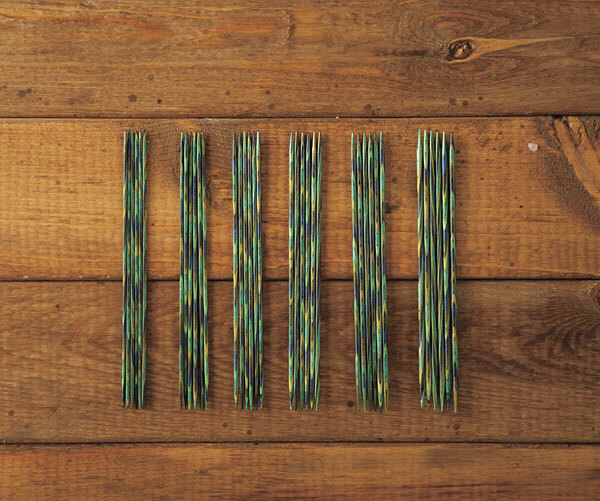 Learn more about our knitting needles. I bought a set of Caspian 5" and Harmony 5" as I work socks two at a time and the different color needles help me keep track of which sock I am working on. While working on size 0 I had 2 of the Caspians break while the Harmonys were still going strong. Upon close inspection it looked like a weak layer in the laminate. I contacted customer support and they sent me a new set of size 0 which are still going strong after 3 more pairs of socks. All of the originals broke and it looks like it was just a bad batch. These things happen when you are working with laminated wood. Great customer support and Great products! I love these dpns! Beautiful, strong, snag free, and did I mention beautiful? I intend on building my collection of knitting needles out of the many colors of needles that knit picks has to offer! A bit pricy, but you get what you pay for. And I've paid for quality with these needles! I may try the crochet hooks in caspian also! These needles leave a lot to be desired. I had thought when I ordered them, that they were the old Harmonies but in a different color. They are absolutely not the old needles. These needles bend, snap in half and the bend stays in the needle thus making them not straight any longer. They are very pretty to look at, and very smooth like the old harmonies, but they are simply not made out of the same material. I've had my Harmonies for over 5 years and they've lasted a long time, this set pales in comparison, and should be completely taken off the market and the old style of needles put back. Quality is everything and in this, these needles are lacking. These needles are amazing! They are resilient enough to handle a tight grip without digging into my hands. 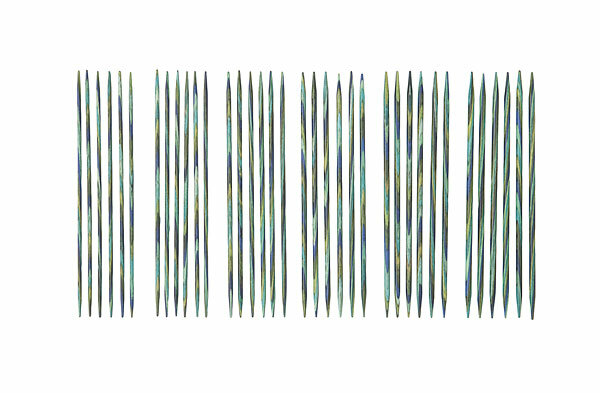 I am so happy that I purchased this set, and I continue to be surprised by the Caspian line of needles.